Cranial cruciate ligament rupture is a very common condition affecting dogs of all ages and breeds and occasionally cats. 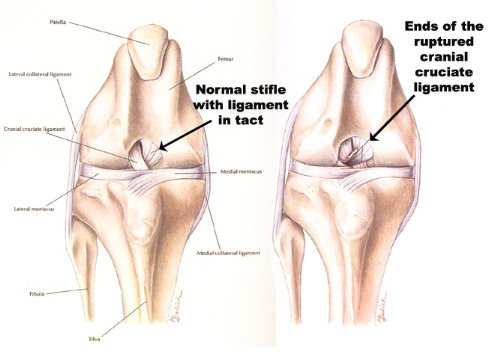 The cranial cruciate ligament is located inside the knee joint and is one of four ligaments stabilising the knee joint. An intact cranial cruciate ligament is necessary to prevent forward and backward sliding of the femur on the tibia bone. Tearing of the cruciate ligament can be caused by a sudden traumatic event or it can be a more gradual degeneration of the ligament called a partial cruciate ligament rupture. 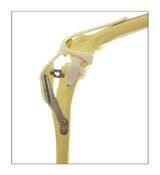 Complete tears of the ligament usually result in non-weightbearing on the limb. Partial tears usually cause a milder lameness. Once the ligament is torn or degraded it never repairs itself. Without an intact cruciate ligament the knee is unstable. Wear between the bones and menisci becomes abnormal. This causes pain and inflammation and the joint begins to develop arthritis and loss of function occurs. Several surgical methods exist for stabilizing the knee with a cruciate ligament rupture. We perform both techniques at our hospital. This traditional surgical technique has been performed for many years. A very strong synthetic suture is implanted just outside the joint capsule which mimics the action of the cruciate ligament in keeping the knee stable. This technique has very good results in small to medium dogs and often has good results in larger dogs, however the TTA technique is superior for large and active dogs. The TTA technique stabilises the knee by changing the biomechanics of the knee joint. This is achieved by making an osteotomy (bone cut) just behind the tibial tuberosity. This tuberosity is then moved forward to achieve a perpendicular relationship between the tibial plateau (the top of the shin bone) and the patellar tendon.The advanced tuberosity is secured using titanium implants. This restructure and redistributrion of forces acting on the knee joint provides stability without the need for an intact cruciate ligament. The osteotomy usually heals in 8 to 12 weeks. The majority of dogs having a TTA achieves a normal to near normal limb function.